Highway 1 is closed near Langford between West Shore Parkway and Shawnigan Lake Road as heavy snow continues to fall on the Malahat. Northbound traffic is closed at West Shore Parkway. 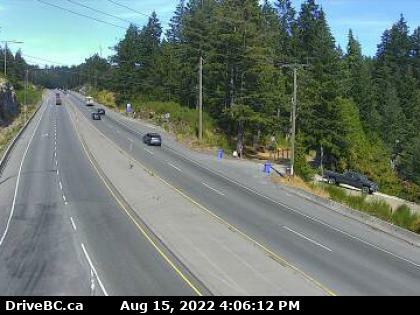 Southbound traffic is closed in Mill Bay and at south Shawnigan Lake Rd. Highway maintenance crews with Mainroad Contracting are attempting to clear the roadway with plows. Prior to the closure, several vehicles were stuck on the roadway blocking the plows from getting through. Heavy snowfall began in some areas of town around 3 p.m. Sunday and gained momentum as the afternoon progressed. There is no time frame on when the highway will reopen. The Pat Bay Highway is also experiencing heavy snowfall and numerous vehicles have slid into the ditch. According to the latest weather alert, Greater Victoria could see anywhere from 10 to 20 cm of snow overnight. Environment Canada warns that even small changes could result in major differences in the amount of snow we receive. Saanich Police are advising motorists to stay off the roads, and if travel is neccesary, winter tires or chains are required. Police are responding to numerous crashes throughout the capital region. 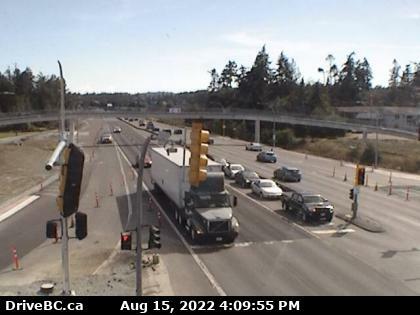 Current view of Hwy 1 at West Shore Parkway northbound. 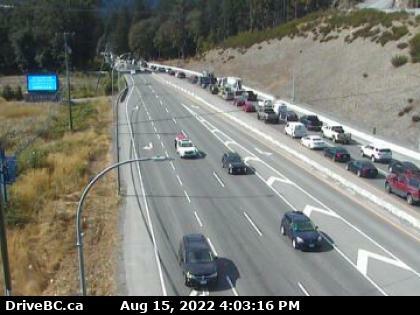 Current view of Hwy 17 at Mt Newton Cross Rd, looking south.